As rock & roll gets older – really as any medium of art gets older – the questions start amassing about where there is left to explore once more and more corners of a once dimly lit room are illuminated. What once seemed unlimited is now boxed neatly with walls – sturdy, supportive and finite. What’s a good decorator to do? One option is to create the illusion of more space, and one of the easiest ways to do this is to place broad mirrors at the end of a room. They provide the illusion of depth and space, making the room feel larger than it really is. These mirrors reflect back on the space of the room, showing everything the room contains, framing within the mirror’s confines a view of the world that ties everything together. Enter Chapel Hill, NC’s Lake Inferior. One of the first bands signed to the University of North Carolina’s student-run record label, Vinyl Records, the five piece pull from the many disparate areas of rock & roll’s lineage. While the question of “where is left to go” must seem daunting to artists, Lake Inferior refutes the question, concentrating on how to incorporate all that has already been found. 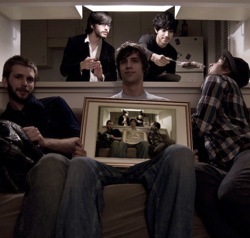 The band’s debut, self-titled, EP embraces modern anthemic indie like Arcade Fire, touches of time signature and mood shifts, blaring horns and frenetic, racing rock. These particular influences aren’t confined just to particular songs – nor are they the only notes struck. Throw in a seeming penchant for the world-embracing folk-rock of North Carolina contemporaries like Bombadil, flourishes of the dancey rhythms of Talking Heads and, seriously, a bit of the odd pairings and shifts of prog-rock. On the surface this sounds like a studio experiment just waiting to fall flat on its face, but Lake Inferior excel in composition and the EP strolls through its six songs with a fierce confidence in its work. “How the Wars Are Won” opens the EP with a deft appreciation for the aforementioned Arcade Fire, here sounding like fellow populist songsmiths. “Landlocked Surf Rock” takes nearly two and a half minutes to reach its vocals, but the style-hopping turns it takes to get there leads to a dynamic song within the song. But it’s the note-perfect “Spiders” that is the crown jewel of this EP and that will undoubtedly have people dancing, figuratively or literally. It’s the song that immediately calls to mind the influence of Talking Heads, touching also on the infectious electronic punctuations of Animal Collective. It’s a swinging, pulsing, living song that is impossible to ignore. It sounds, underneath, like the cartoony music that should underline some mammoth creature’s stroll through the underbrush, like a lost bit of Bjork’s Post heyday. http://www.lakeinferior.com for more music, summer tour details, and to purchase the album. Yes. Yes it is, Tori. I tried as best I could to explain what it is about this EP that has grabbed me so, but really what it comes down to is that I just enjoy the hell out of it. I was lucky enough to see Lake Inferior open for Deerhunter at Cat’s Cradle! They put on an awesome show… with that and what I’ve heard of their EP, methinks these kids are going places quick, and deservedly so. I trust recs from this site. And again, you haven’t disappointed. Great tunes. Someone needs to pay attention to these guys. Would like to hear a top-notch recording done by them. i bought the EP after hearing Spiders. outstanding effort. can’t wait to see them live. wow great song, I really definitely check out more of them.. that song has such an awesome heavy bass! … after listening to that song over and over I now have to fix the frames that i have hanging on the wall! Great recommendation Thanks!